ABC Russian: Giant snowballs appear in Siberia+ video! Giant snowballs appear in Siberia+ video! 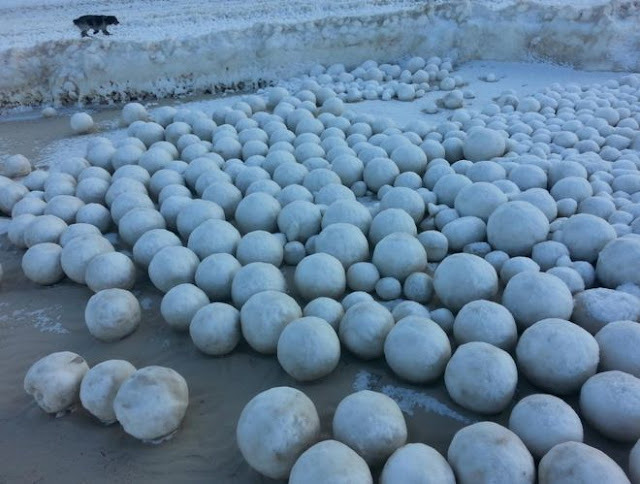 A strange and beautiful sight greeted locals in the Gulf of Ob, in northwest Siberia, after thousands of natural snowballs formed on the beach. In Russia, Siberia an 18km stretch of coast was covered in the icy spheres. Why? The sculptural shapes range from the size of a tennis ball to almost 1m (3ft) across. They result from a rare environmental process where small pieces of ice form, are rolled by wind and water, and end up as giant snowballs. Locals in the village of Nyda, which lies on the Yamal Peninsula just above the Arctic Circle, say they have never seen anything to compare to them. "As a rule, first there is a primary natural phenomenon - sludge ice, slob ice. Then comes a combination of the effects of the wind, the lay of the coastline, and the temperature and wind conditions.